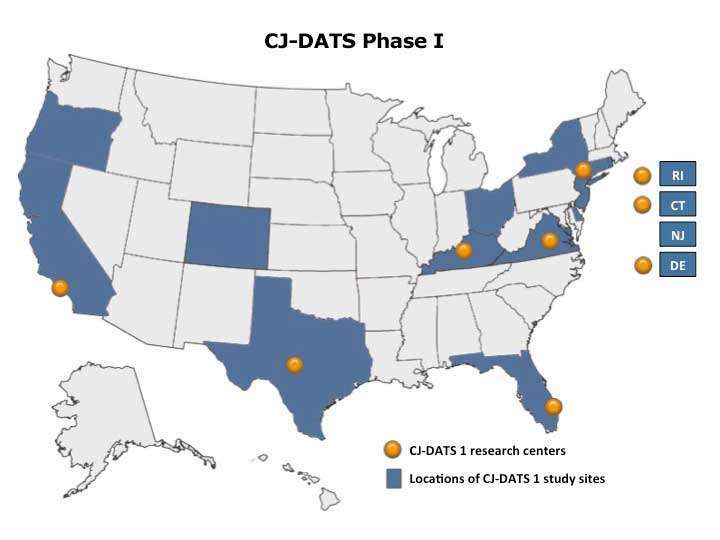 CJ-DATS (the national Criminal Justice Drug Abuse Treatment Studies) was launched in 2002 and two initiatives (CJ-DATS-1 and CJ-DATS-2) were carried out from 2002 to 2014. The overarching goal of the CJ-DATS cooperative research programs was to improve both public health and public safety outcomes for substance abusing offenders leaving prison or jail and returning to the community by integrating substance abuse treatment into the criminal justice system. At that time CJ-DATS-1 was launched, an estimated 600,000 inmates were released each year in the United States, with approximately two-thirds having substance abuse problems that, if left unaddressed, could increase the risk of relapse and recidivism to crime. 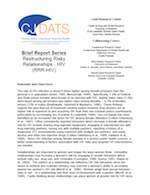 CJ-DATS was designed to identify ways in which these offenders could benefit from the continuum of effective substance abuse treatment services. 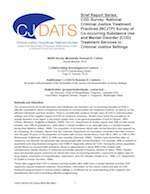 CJ-DATS tested several strategies for improving drug abuse treatment services through the coordination with criminal justice assessment, monitoring, and supervision activities. 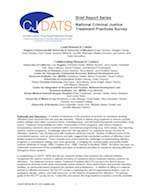 Further, the CJ-DATS initiatives were designed to inform the development of models for integrating evidence based substance abuse treatment with the criminal justice system. 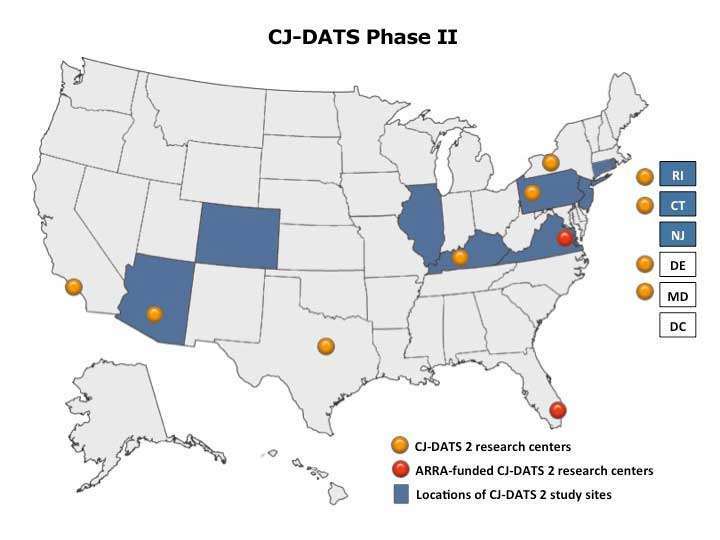 From 2002 through 2008, CJ-DATS-1 researchers from 9 research centers, a coordinating center, and NIDA worked together with federal, state, and local criminal justice partners to develop and test integrated approaches to the treatment of offenders with drug use disorders. 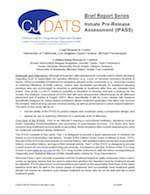 Although at least two valid assessments previously existed to inform decisions regarding level of supervision for paroling offenders (e.g., Level of Services Inventory) or modality of treatment for substance abusers in the community (e.g., ASAM criteria), neither of these assessments was developed specifically for substance-abusing parolees who are encouraged or required to participate in treatment after they are released from prison. IPASS was developed specifically as a post-release risk measure for prison-based substance abuse treatment graduates by taking into account the inmates’ historical drug use and criminal activity as well as his or her performance during the prison-based treatment program. Test the ability of the IPASS to predict relapse and recidivism using a prospective design. An understanding of the presence and extent of co-occurring disorders (co-existing substance use and mental disorders, of COD) is essential to improving the design of COD programming, both in prison and upon release. The measures currently employed in criminal justice programs, particularly those developed to screen for mental health disorder, typically focus on mental disorders or substance abuse disorders separately, and fail to examine the extent to which these disorders co-exist in the criminal justice population. Develop a brief screening instrument that identifies individuals with COD in 20 minutes or less and that could be self-administered or administered by staff who do not have mental health training. Assess the feasibility of using the instrument to determine rates of COD in the offender population by conducting a study of 300 consecutive admissions to prison-based substance abuse treatment programs at selected sites. Given the limited ability of treatment for offenders with substance abuse problems, correctional systems need to optimize the benefits from their treatment programs and determine which components are having the greatest impact on psychological, cognitive, and behavioral change. Assessments can help correctional systems monitor and document client changes during treatment, providing the foundations for meeting needs in evaluating and managing services. 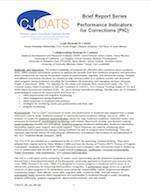 Strategies for monitoring needs and performance over time, and program functioning and organizational change. Community-based re-entry treatment programs for correctional populations often are not integrated into using an overall "continuing-care" strategy and are not managed or monitored according to procedures designed to help guide or maximize their effectiveness. The objective for this study was to establish guidelines and resources for an evidence-based library of targeted treatment intervention components for outpatient (i.e., moderate severity) re-entry correctional programs. These materials were drawn primarily from existing drug treatment resources, especially those previously developed by CJ-DATS Research Centers. The TCU Treatment Model provides conceptual and scientific foundations for the use of targeted interventions that address client problems related to treatment readiness and motivation, anger and hostility, criminal thinking, risky behaviors for HIV/AIDS/Hepatitis C, communication, and other social skill deficits. 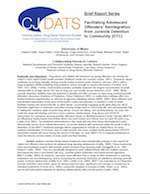 Address counseling needs in community re-entry treatment programs. Meet "evidence-based" standards of effectiveness for correctional populations. Represent brief, flexible, and focused treatment tools, and are judged and adopted as user-friendly and manual-guided applications. A major obstacle to the effectiveness of post-prison treatment for substance-abusing offenders is low treatment engagement: the failure of parolees to show up for scheduled treatment and, if they do show up, their tendency to drop out early. This is particularly a problem where participation in treatment by parolees is voluntary, where incentives (pressures) to enter and remain in treatment are usually minimal. The Transitional Case Management study tested whether case management taking place during a prison inmate’s transition from prison to the community increases participation in community drug abuse treatment, enhances access to needed social services, and improves outcomes. Assess whether the TCM intervention increases the likelihood that parolees leaving prison treatment enter and successfully complete treatment, gain access to needed services, and reduce drug relapse and recidivism. Determine whether the TCM intervention increases the likelihood that treatment, criminal justice, and community services agency staff improve their patterns of communication and collaboration in dealing with substance-abusing parolees. Assess whether the TCM intervention is more cost effective than standard referral processes. The parole and outpatient addiction treatment systems have limited collaboration and communication, which may lead to a multitude of behavioral expectations with variable reinforcement. Research supports that behavioral outcomes are optimized when behavioral expectations are few in number, clear, and consistently reinforced. Step’n Out examined whether improved integration between the parole and outpatient addiction treatment systems improved treatment adherence, drug use, and public safety outcomes among drug-involved parolees. Systematize collaborative assessment, treatment orientation, planning, and monitoring between parole officers, treatment counselors and clients. Encourage therapeutic relationships and lasting behavioral change through a coordinated, supportive approach to supervision that emphasizes the client’s pro-social goals and positive responses to their attainment. 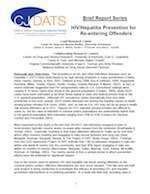 HIV Prevention for Drug-Involved Offenders During Reentry was designed to address the prevalence of HIV/HCV/HBV within the community corrections offender population. The study examined the effectiveness of a HIV/HCV/HBV intervention protocol and was designed to learn how it is integrated into community corrections. The approach was a multi-media prevention intervention utilizing an interactive DVD and workbook tailored to specific gender and ethnic groups and risk behaviors. Collecting HIV, HCV and HBV risk behavior information. Implement and evaluate the effectiveness of a newly refined HIV/HCV/HBV prevention/intervention protocol (the CJ Targeted Intervention). Determine the relative effectiveness of the interventions when delivered by a certified HIV peer interventionist counselor. Integrate HIV/HCV/HBV prevention into the post-release community supervision process. Examine how intervention delivery is affected by different organizational structures and orientations. This project examined a HIV intervention addressing women’s HIV risks. The overall goal of this project was to develop an HIV intervention for criminal justice involved female drug abusers who are re-entering the community. The intervention focused on reducing HIV behaviors by restructuring relationship thinking errors to help women make safer decisions about risky HIV related behaviors. Develop the RRR-HIV intervention manual which incorporates relationships, thinking errors, and HIV related risky behaviors. Pilot the RRR-HIV intervention to examine the content and feasibility of delivery. The Two Reentry Strategies study responds to the critical need to implement, evaluate, and identify effective reentry programs for adolescents with substance use problems involved in the juvenile justice system. The study involved two phases. Phase 1 was a short-term project involving a cross sectional assessment of drug-involved youths receiving treatment in justice system residential facilities. Its purpose was to classify juveniles based on whether their substance use was a primary problem or was secondary to other problems such as psychiatric disorders, criminal involvement, or experience of physical, sexual, or psychological trauma. Phase 2 was a longer-term study comparing two reentry protocols: Cognitive Restructuring (CR), and alternative aftercare services (AAS) in regard to post-reentry treatment outcomes. This study examined interactions of these programs with the youth profiles identified in Phase 1. Drug abuse and related risk behaviors by young offenders are among the nation’s most urgent public health priorities. While there have been important advances in the development of specialized treatments for the constellation of risk behaviors associated with teen drug abuse in the past decade, little progress has been made in addressing the overwhelming problem of drug abuse and related risk behaviors among juvenile detainees. Adapting existing science-based interventions to develop specialized services that will address drug abuse, delinquency, and sexual risk taking among juvenile detainees. Testing an innovative, phasic, multiple-systems intervention in which the in-detention work provides a platform for the adolescent’s return to the community. Testing a family-based HIV/AIDS prevention intervention in comparison to standard HIV prevention. The National Criminal Justice Treatment Practices Survey provided estimates of the prevalence of certain treatment delivery practices within the criminal justice system and expanded our understanding of the organizational and structural issues that influence practice. The survey provides a platform for the development of a new generation of research regarding systems issues by identifying general trends in the delivery of services and the influencing factors. Describe current drug treatment practices and delivery systems for offenders including the policies, philosophy, resources, and organizational structure of the delivery systems. Develop a common set of organizational and system measures of drug treatment practices in correctional settings, including system integration measures. Understand the role of organizational factors and dynamics in the drug treatment practices and systems integration within the research cooperative and nationally. The COD Survey extended the NCJTP with the goal of increasing knowledge about the service delivery and organizational practices for offenders with co-occurring disorders in the criminal justice system. The sample included wardens/directors of prisons and jails; administrators in charge for probation and parole offices; and directors of outpatient substance abuse treatment programs that treat criminal justice clients (a total of 1046 adult and juvenile facilities) previously included in the NCJTP. Describe the services available to offenders evincing co-occurring substance use and mental disorders. Depict the organizational practices of the agencies that provide services to offenders with co-occurring disorders. Explain the relationship between organizational practices and the provision of services for offenders with co-occurring disorders. The e-Court project was intended to address practical needs involving monitoring and reporting on drug courts nationally while also building basic knowledge on technology transfer and the role of technology in advancing program implementation and effectiveness. Develop and test a management information system (MIS) for monitoring performance at the individual (client) and program level that can be readily adopted and implemented in drug courts receiving federal funding. The system was designed to record and facilitate case management activities of line staff, generate reports the court can use to monitor progress and inform development, and provide data needed for the federal Office of Justice Programs to describe court practices and assess performance. Assess how drug courts used web-based technology and examine the role of various organizational factors in the adoption and effective use of a web-based MIS developed for the drug court setting. Investigate the actual and potential impacts of information technology on drug court performance in the areas of case management, client compliance with treatment and supervision mandates, integration of justice and service systems, and the provision of effective treatment to drug court clients. 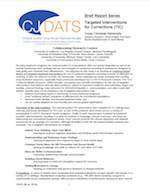 The second phase of CJ-DATS, engaging a new cohort of research centers and agency partners, was launched in 2008 with a focus on conducting implementation research in these criminal settings. Specifically, NIDA charged the cooperative with testing implementation strategies that could result in sustained uptake and delivery of services in three domains: (1) delivery of medication-assisted treatment for offenders transitioning to the community; (2) delivery of an HIV continuum of care (i.e., screening and counseling, risk reduction interventions, and continuity of antiretroviral treatment from prison or jail into the community); and (3) implementation of screening and assessment processes to identify offenders with drug abuse and related health problems and to inform their treatment planning and re-entry process. In each domain, grantees were to focus on organizational and system-level implementation strategies, and to engage both community corrections and community-based treatment providers in a process that would leverage key facilitators, address barriers, and jointly address the public safety concerns of criminal justice agencies with the public health goals of the Institute and the community-based treatment partners. 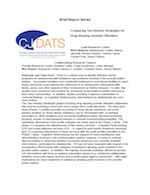 NIDA’s ultimate goal for CJ-DATS is to identify implementation strategies that maximize the likelihood of sustained delivery of evidence-based practices to improve offender drug abuse and HIV outcomes, and to decrease their risk of incarceration. The MATICCE protocol focuses on implementing linkages to medication-assisted treatment in correctional settings. The US Food and Drug Administration (FDA) has approved medications for use in the treatment of alcohol and opiate dependence. Unlike much of the healthcare system, in which new medications are routinely introduced and adopted, the US addiction treatment system has been slow to adopt pharmacotherapies, lacks trained and credentialed personnel to deliver them, and evidences a longstanding philosophical preference for “drug free” treatment. These constraints and concerns are magnified in community corrections agencies, where the appropriate role of pharmacotherapy is not well understood, and the medically appropriate use of opioid agonists (e.g., methadone) may present challenges for monitoring offenders’ illicit drug use. In the MATICCE study, community corrections staff engage in training about addiction pharmacotherapies, while leadership in the corrections and treatment facilities engage in a joint strategic planning process to identify and resolve barriers to efficient flow of clients across the two systems. Importantly, the objective is to leverage treatment services that already exist in the community. This means that the implementation strategy is not designed to promote the delivery of clinical services nor medication prescribing within or by probation and parole offices, but rather is targeted at facilitating linkages between organizations that, despite sharing the same clients, lack incentive to coordinate services, or otherwise do not view themselves as sharing a common mission. HIV-STIC focuses on implementing interventions to address the HIV continuum of care in correctional settings. Evidence-based approaches exist for HIV risk reduction, testing, and treatment with antiretroviral therapy. However, there are significant gaps in this service continuum for offenders in the criminal justice system. Services may or may not be provided while individuals are incarcerated; transitions to the community may introduce additional service disruptions; and individual offenders face challenges navigating their prevention, testing and treatment options. The HIV-STIC study protocol tests a modified NIATx process to facilitate site-specific improvements in the HIV services continuum. In both control sites and sites randomized to the modified NIATx process, criminal justice staff receive training on the fundamentals of HIV prevention and treatment. Sites randomized to the experimental condition form a local change team to engage in a process improvement approach with external coaching to implement a more complete HIV services continuum. Within the overall parameters of the protocol – which emphasizes HIV testing and linkage to treatment – sites assess local needs and existing services, set priorities for service improvements, and develop specific goals and strategies for achieving them. All sites participating in the HIV-STIC study target three goals: (1) improving the perceived value of HIV services among corrections staff; (2) increasing service penetration for inmates with or at risk for HIV; and (3) improving the quality of HIV service delivery. 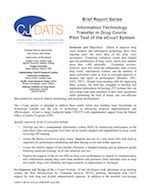 The Assessment OPII study focuses on implementing assessment and treatment planning processes. Screening and assessment are used to identify substance abuse-related problems and to develop programming to address the problems so identified. Conducting a valid and reliable assessment is considered an essential step in providing effective treatment services and in being able to prioritize treatment and services according to type and severity of need. While research has established that a number of screening and assessment instruments (e.g., ASI, GAIN, LSI-R) have adequate validity and reliability, there is far less research on the successful implementation of these assessment tools, or on how they should be used to improve the course and effectiveness of treatment. Like the HIV-STIC protocol, the Assessment OPII study also uses a modified NIATx approach. In contrast to the HIV-STIC protocol, which focuses on promoting the uptake of specific services, the Assessment OPII study engages corrections and treatment agencies to improve the quality of interagency communication through the effective use of assessment and case planning processes and treatment referrals. Both interagency and intra-agency change processes are targeted. A multi-phase implementation protocol is used, wherein agencies engage in team development, needs assessment, planning, implementation, and sustainability in distinct steps. Each site’s change team has a designated facilitator, and their activities are coordinated across sites through the use of a facilitator manual and ongoing fidelity measurement. Early and delayed-start sites allow the research team to control for effects of environmental changes within states. The key outcomes for this protocol reflect improvements in the use of assessment and case planning procedures for offenders. Specifically, offenders should not only receive comprehensive assessments, but the results of these assessments should inform case plans, and the information in the case plan should be conveyed to the local treatment provider agency to which the offender is referred upon release. The protocol targets critical communications channels between otherwise highly segregated correctional and treatment agencies. Steven S. Martin, MA, MSc. William Burdon, Ph.D. Patricia Noble-Desy, M.A. Prendergast ML, Cartier J. (2008). 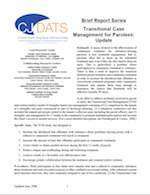 Improving parolees’ participation in drug treatment and other services through strengths case management. 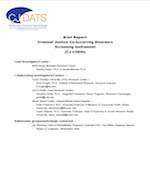 Perspectives: Journal of the American Probation and Parole Association, 32(1), 38-46.